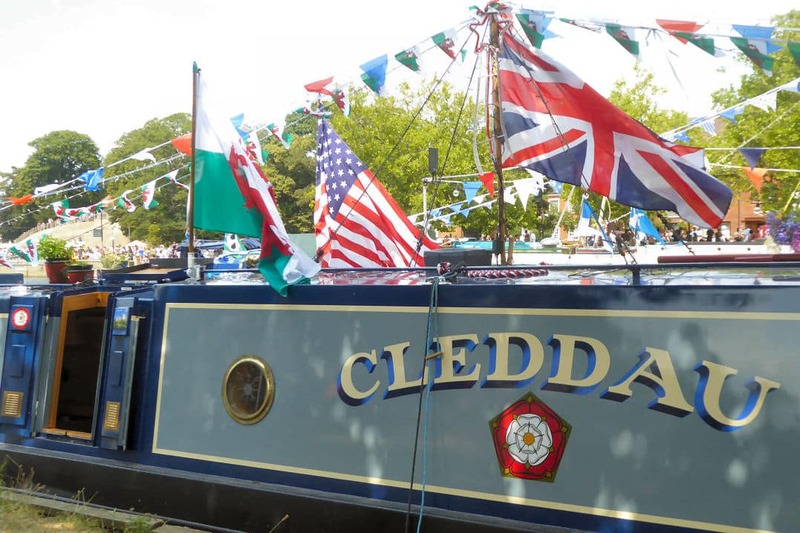 After a winter of route planning, a spring of impatience awaiting Cleddau’s release from the Nantwich paint shed, after a summer of creating broom handle flag poles, after 353 miles, 110 locks, 8 waterways and a sea crossing, Cleddau eventually reached the site of the 2018 Bedford River Festival. even a squadron of rubbish skips corralled and locked away until released and positioned across the Festival site. was already in position at mooring 69. Out from the bank she was moved, to allow Cleddau a prominent position for local visitors. Keen to establish territorial rights the Captain erected a gazebo, a smart move in the face of the anticipated crowds. Early evening a Chinese family hovered by the boat, intrigued. 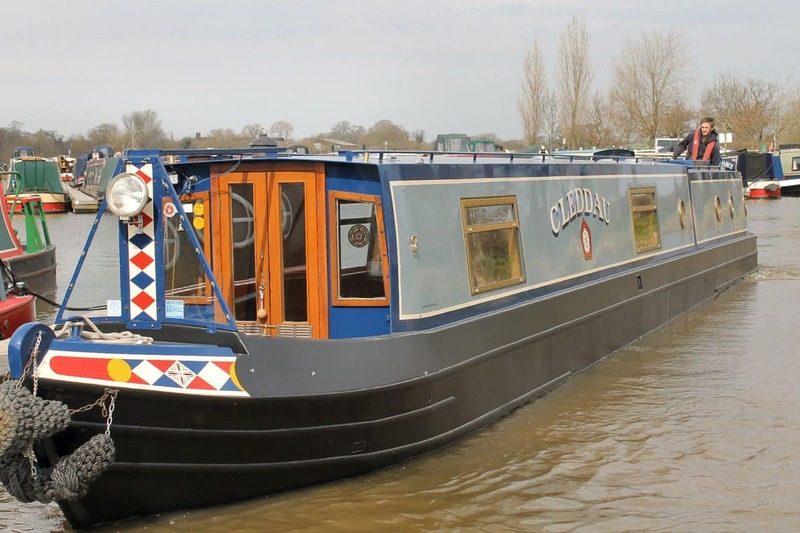 The young mother was a research engineer at Cranfield University; what did her non-English speaking parents make of the inside of a narrow boat? Her six year old son was hugely enthusiastic, loving his moments at the business end when the Captain on the engine deck showed him how to turn the engine on – and off. During a curiously quiet evening only the laughter and boogie beat from the John Bunyan trip boat, out on a privately hired trip, disturbed the river’s tranquillity. Heavy equipment and vehicles lumbered and squeezed across the weir bridge just behind Cleddau. More marquees, pop up stalls, exhibition tents, food supplies, display materials, liquid refreshments… Would-be festival goers strolled by, regular cyclists weaved along the path, security stewards checked the route. Tentatrice (with crew and Boat Dog) arrived to complete the Chouette sandwich, three boats breasted up side by side. By mid-afternoon the Mayor was making an inspection. Just before nightfall thee was a Monkton Moment*, the first of several. “Cleddau – that must mean Pembrokeshire, I come from Haverfordwest,” beamed a slightly inebriated young man. As darkness fell a call went up: “Better test the lights…” Fairy lights flashed on above Chouette and Tentatrice and Cleddau. But then, horror – one long length of the lights, arranged diagonally across the boat had failed. Saturday morning saw frantic action to replace the lights with a working strand…. rubbish bins (general and for recyclable items) were distributed around the site. Steadily the crowds began to swell throughout the morning. Narrow boats and cruisers lined the southern river bank, crews, guests and spectators eager to watch and to participate in the fun. From Mooring 69 the views were excellent upstream towards Town Bridge and St Paul’s Church. Local friends and neighbours arrived throughout the day and evening to see the boat… to ride during the parades … to enjoy the bankside viewing points… The Pimms bottle emptied, Welsh cakes and brownies provided suitable energy inputs and Boatwif ran tours through the boat for curious children. A boat used in World War 1 ploughed up and down the river, its male crew wearing pith helmets. Ashore visitors could inspect a trench aid point. The Fire and Rescue boat made several trips in front of the crowds. Early afternoon the cruisers went on parade. Blasting music loudly along came Star Wars. What was there not to admire about the distinctively dressed characters and appropriate scenery of The Wizard of Oz? “Look, there’s someone dressed as a Mayor,” said a wit, as a smart launch passed by. The effect of plastics on marine life was effectively demonstrated by this cruiser. celebrated the 40 years since the very first River Festival, (“Just a few rafts it was,” explained one Bedford-born neighbour). 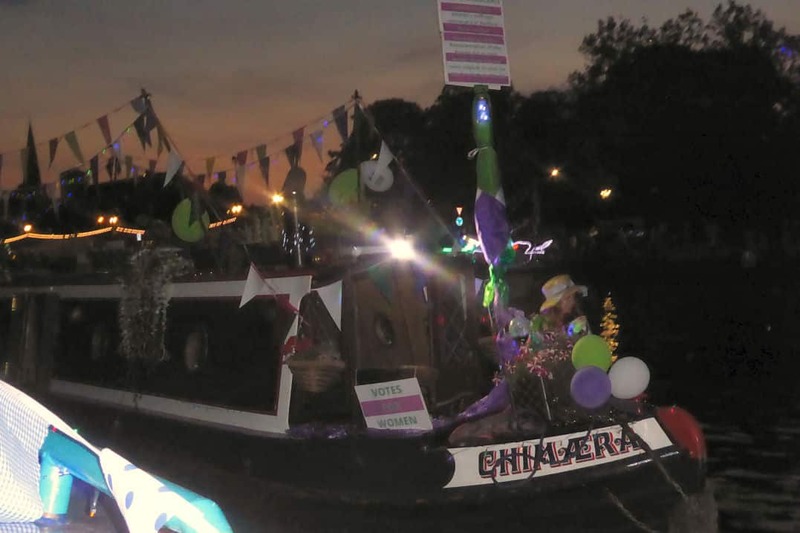 Nb Chimaera won Best Dressed Narrow Boat for its presentation of the Suffragette centenary of winning votes for some women. both gained additional crew (Boatwif’s former colleagues) while the Exemplary Neighbours were aboard Cleddau. Such manoeuvres require time and space… congestion and certain cruiser ill-discipline made some of the route a testy business. Above the noise of the crowds came another sound – a Spitfire (probably from Old Warden). Better still on Sunday was the Merlin engine sound as a Lancaster did several passes over the town. cruisers, small boats and a handful of narrowboats weaving colourful paths across the water. or lay listening to smooth jazz. Early estimates were of over three hundred thousand people attending the Festival – though not every single one of those pitched up at nb Cleddau… Many though used the backdrop of the boats, the bunting and the flags for their selfies and photos. the fine weather, Cleddau’s many visitors and the friendliness and good humour of all those thousands of festival goers. It took a while (well, several hours) to strike camp and to dismantle Cleddau’s roof decorations on Monday morning. Almost as a finale, it seemed, to all those wonderful exchanges over the weekend came a most excellent Monkton Moment* at Town Lock. regaling how as a lad he had dropped his jerkin over a Pembroke Castle wall – and, best of all, how it was his father, an Admiralty civil engineer, who sent a Minute to the Ministry of Defence alerting the MOD to the true nature of the hull beneath the Pembroke Dock oil pontoon. 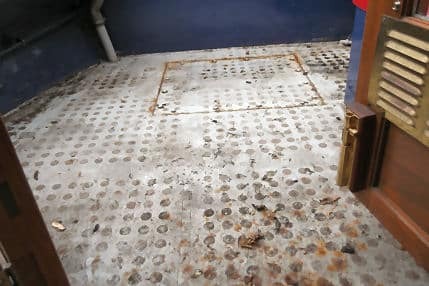 Readers may know the rest – how the hull was that of the Warrior, the first iron-clad hull, now restored and preserved at Portsmouth Historic Dockyard.